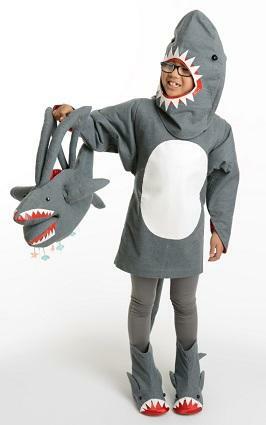 A shark costume pattern can make a feisty and original costume for Halloween, dress-up play, or other occasions. Kids often like a costume that's a bit different and on the adventurous side, and a shark certainly fits the bill. Kids of all ages are fascinated with sea and ocean life, and a shark costume can be a fun way to indulge in the fantastical world of the sea. Check major pattern manufacturer's websites for new costume patterns, or search auction and resale sites like ioffer and eBay for vintage shark patterns as well. Burda Pattern 151: This costume pattern from European pattern company Burda offers an adorable shark patterns. The sweat suit style costume is perfect for cooler weather. This pattern is rated novice. Vintage McCall's Pattern 2205 includes a cute open mouth shark pattern, as well as flower and penguin patterns. Vintage Simplicity Costume Pattern 9813 features a large head shark pattern modeled after the 1994-1995 animated series "Street Sharks." Make sure to check sizing information carefully for vintage or out of print costume patterns before purchasing, as they may differ from contemporary sizing. Use the specific pattern recommendations to determine the best material. Great shark colors include blue, grey, and dark gray. For those who aren't handy with a sewing machine, with a little ingenuity you can still create a great costume patterned after a shark. Build a simple costume with seats based on these easy shark costume instructions from Stretcher.com's Cheap Halloween Costume page. The bonus is how economical this costume is as well! For an even simpler design, simply don gray sweats and add detachable shark fins, available at Oriental Trading Company. Or use a shark mask or accessories to complete the costume. What's gorier than a fearsome shark? A shark-attack victim! This costume may not be suitable for younger children, but might be an option for older kids, teens, and adults. This creative costume can be made simply with old clothing and some fake blood. To create this costume, use old or thrift store ripped clothing and spatter or drip fake blood strategically around the ensemble. This can also be a fun homemade Halloween costume for couples - use a pattern to make a shark costume for one person, and the other person can be the victim. Since adult costume patterns for sharks can be more difficult to find, you an create your own pattern using simple no-sew materials such as felt, or purchase a shark or mascot costume from a retailer. You can also modify a shark costume pattern to make it a victim costume by attaching old jeans and shoes to the mouth area of the shark to make it appear as if the shark is swallowing its victim. Shark costumes patterns are not always simple to find, but with a little searching a suitable selection may be available. Or, simply use your creativity and some inexpensive accessories to create this fun and original costume.